Dong Thap (VNA) – A consultation seminar to develop a project on switching livelihoods for farmers in the Mekong Delta was held in Dong Thap province on March 26, involving the Ministry of Agriculture and Rural Development, the World Bank and Dong Thap People’s Committee. 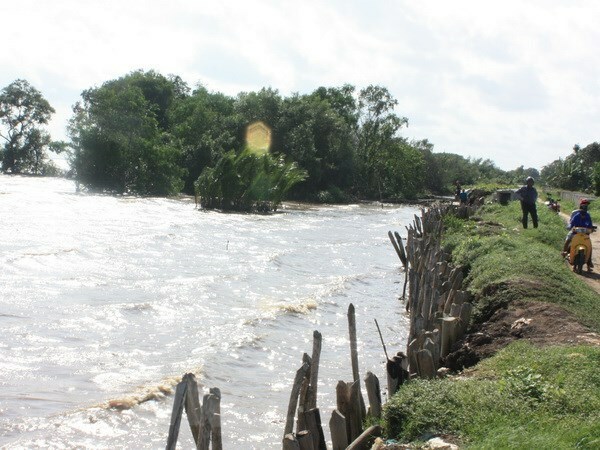 The project, expected to cost 40 million USD to be sourced from non-refundable aid from the Green Climate Fund, aims to help farmer households to switch their livelihoods to those more resilient to climate change as well as enhancing the involvement of farmers in flood-based value chains, focusing on selected areas in the region most heavily affected by flooding. Anjali Acharya – senior environment expert for World Bank, which provides trustee services for the GCF – said the first component of the project is to support the implementation of policies regarding resilience to climate change, while the second component will expand climate change resilience for inter-provincial projects. The third component focuses on management and supervision. The Mekong Delta provinces of Dong Thap, Long An, and Tien Giang are building a connectivity project for sustainable development in the Dong Thap Muoi sub-region, with a focus on developing signature farm produce brands, ecological tourism, transportation infrastructure, irrigation, water and power supply in rural areas, spatial planning, water resources management, regional information system, and regional policymaking.